Where: Interviewed at their elegant colonial-style home a few blocks from the Reed campus in Eastmoreland. 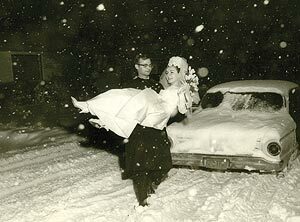 Kathia Emery ’67 and Jim Kahan ’64 on their wedding day in 1964. In 1963, at the beginning of his senior year, Jim Kahan decided to find a wife. He knew he wanted to marry a Reedie and he set about the process systematically. He had a job in the registrar’s office and helped out with enrollment in Humanities 110, so he got to check out all the prospects. He wrote down the names of his most promising candidates on a slip of paper—there were four in all, and Kathia Naumann was one of them. Their courtship was quick, and they were married in December 1964—Kathia was 19, Jim was 22. After the wedding, they headed cross-country to North Carolina for him to attend graduate school. The marriage lasted two-and-a-half years. Kathia says she ended it, and the parting was acrimonious. After that, they had no contact for nearly four decades. In 2004, Jim was living in The Hague, working for RAND and making plans to attend his 40th Reed reunion. He googled Kathia and emailed her. 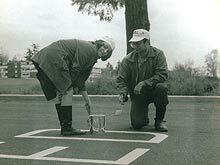 They met for lunch near Kathia’s office when Jim got to Portland, then she drove him back to campus, where he found a room where he could plug in a music player. They did some folk dancing—a Swedish one that they both knew, then a Norwegian one that was new to Kathia. “She can follow anything,” Jim says. The couple on Canyon Day. 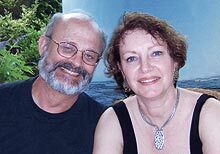 In November 2004, Kathia’s husband, Bud Emery, died unexpectedly after an angiogram. Around that time, Jim was asked to give the 2005 commencement speech at Reed. They continued to exchange emails—he helping her through her grief, she says. Eventually, the depth of the emails intensified. After all, says Jim, “this was the woman I loved more than anyone else in the world.” He asked permission to call on her 60th birthday—“and we have spoken every single day since then,” he says. In May 2005, Jim flew back from Europe for commencement, and Kathia met him at the airport. It was a challenging time, full of contentious discussions with Reed students who criticized his selection as commencement speaker because of RAND’s work. Kathia was with him for many of these discussions. “I always knew he was brilliant, and the chemistry was still there,” she says. But she also wanted to see how he related to people, how empathetic and understanding he was. She concluded he had grown a lot since their newlywed days. “I was checking him out, and I was impressed,” she says. Have an opinion about this article? Email the editor.